Woodturning is a great hobby for many and a good business for some. Woodturning has some basic tools and equipment that are absolutely necessary in order to safely and comfortably turn wood. Other tools and equipment can make turning wood even easier and more enjoyable, but can also cost a lot more money. A wood lathe– you have many options, and you don’t need to have the largest, most expensive lathe in order to turn beautiful pens, bowls or other items. Make sure your lathe comes with a chuck. Woodturning chisels (you can’t use regular wood chisels)- There are some excellent low-cost woodturning chisels available to get you started without spending a fortune. Carbide-tipped chisels have replaceable tips, so you won’t need a grinder or other sharpening system. Sharpening system– If you plan to use traditional woodturning chisels, this is a necessity. Dull chisels tear the wood, are dangerous to use, and make woodturning not very fun. Some woodturning chisels are more difficult to sharpen because of a curved bevel. If not done properly, you could really mess up your chisels. 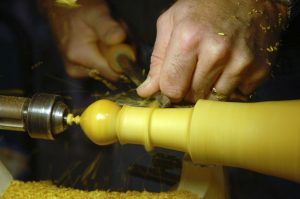 Dust removal- Woodturning can produce a lot of sawdust. You can use a mask, or set up some sort of ventilation system or dust removal system. Chainsaw and Bandsaw- If you want to prepare the wood yourself, you’ll need a chainsaw and a good bandsaw. A bandsaw is especially helpful in preparing wood stock for turning bowls. You can always buy wood blanks that are already prepared.